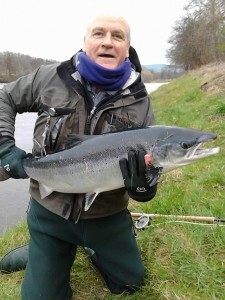 Second fish of the season caught on the River Spey by Scott Mellis (on the Aberlour Beat). Roger Knight, from the Spey District Fishery Board, presents Scott with prizes from the sponsors, Walkers Shortbread and Aberlour Distillery. 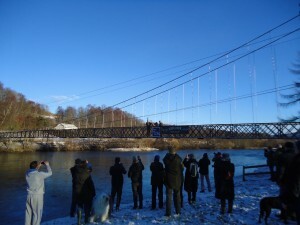 Opening Ceremony of the River Spey took place on Monday 11 February 2019 and was opened by James Walker. 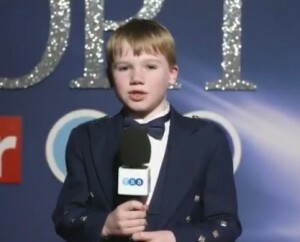 Charlie Kennedy, a primary school pupil from Aberlour was interviewing sports people and celebrities at the Pride of Sport Awards at the Grosvenor Hotel in London, following winning a competition sponsored by the TSB. He is seen below speaking to Jermain Defoe. A Christmas Market was held in the Square in Aberlour on Thursday 7th December. Numerous stalls were on the grass outside and a number of craft stalls were in the neighbouring church. The 75th Aberlour Highland Games took place on Saturday 4th August and was well attended by locals and tourists from all around the world. 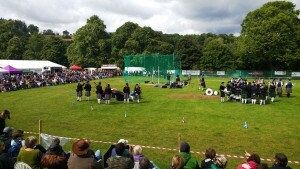 7 Pipe bands took part along with the heavyweight events, track and field and the highland dancing. A new feature added this year was the 10 mile hill race loop from Aberlour to Dufftown and back. Be sure to put the date for attending in your diary for next year – Saturday 3rd August 2019. A Bank Machine is now operational outside the Gather’n Cafe in Aberlour Square . The Gather’n Café incorporating the Three Bags Wool Shop has opened in the Square in Aberlour. The Café is located in the premises formerly occupied by the Clydesdale Bank and follows an extensive refurbishment. A charity which offers tea, cake and friendship to older people is hoping to launch a group in Aberlour as it expands its presence in Moray. 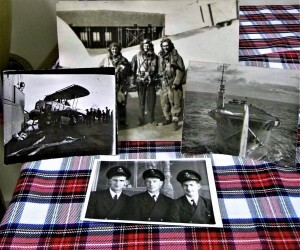 Contact the Elderly recently launched its first Moray group in Elgin and is developing a group Forres. Aberlour’s Station Tea Room has offered to host the monthly Sunday afternoon get-togethers when it is open for the summer months. The charity needs to attract guests and volunteer drivers, as well as hosts for the autumn and winter months. “We are incredibly humbled by the generous offer from the Station Tea Room and would love to get a group launched in Aberlour to offer a vital lifeline of friendship to older people who live alone in the area. “We are encouraging the communities in and around to Aberlour to help us make this group a reality. Are you, or do you know, an older person who lives alone who would enjoy a bit of a blether over a tasty afternoon tea? Do you have a few hours to spare once a month and a car to accompany an older person to the tea parties? Do you have a few hours even just once a year to open your home to a group making an immeasurable difference to the lives of older people locally? An older person is collected by the same volunteer driver each month who joins them at the free, informal and friendly get-togethers. A host welcomes the group of around eight people into their home once or twice a year, providing an afternoon tea and a warm welcome. 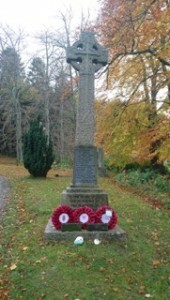 In Forres, Contact the Elderly is also trying to recruit additional guests, as well as volunteer drivers and hosts. To find out more about becoming a guest or volunteer of Contact the Elderly in Moray, contact denise.robson@contact-the-elderly.org.uk or 01542 285010 or visit www.contact-the-elderly.org.uk. 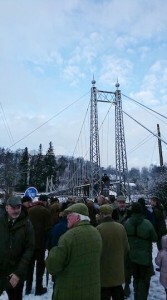 See below for start of the Spey fishing season opening ceremony which took place on Monday 12th February. The Spey Salmon fishing season starts on Monday February 12th. 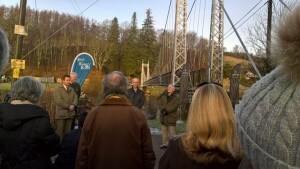 The Opening ceremony will be at 9am on the Victoria Footbridge, Aberlour, pictured below. Winter arrived in Aberlour over the festive season, with temperatures as low as minus 8 degrees C in the village at one point. 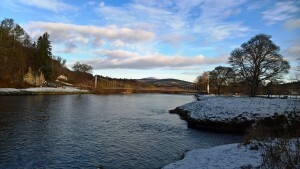 Above is a picture of the Victoria Footbridge over the river Spey in Aberlour. 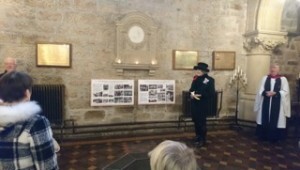 An exhibition of Aberlour Orphanage was opened at St. Margarets Church, Aberlour on Remembrance Sunday by the Lord Luitenant of Banffshire, Claire Russell of Ballindalloch. A new driving route the NORTHEST250, passes through Aberlour as one of the points in the route. Spectacular scenery is promised as it stretches from Speyside to Aberdeen following coastal roads from Spey Bay to Aberdeen, then returns to Speyside via the Deeside road and the famous Cockbridge / Tomintoul pass. Further information can be found by clicking the link above. First major snowfall of the season came to Ben Rinnes behind Aberlour at the weekend 11th/12th November with snow covering most of the hill. 8th November in the Fleming Hall is an exhibition by Fred Olsen Renewables about the proposals for the Paul’s Hill Windfarm II from 3:30pm to 8:30pm. Residents can attend to find out more about the development. 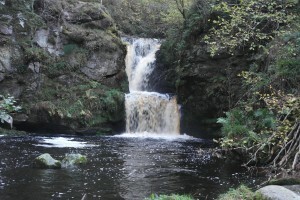 The Linn Falls after the recent rains in Aberlour. It’s that time again! Please join us at our annual Aberlour Christmas Market full of many beautiful handmade items, delicious food, friends, fun, raffles and Santa! 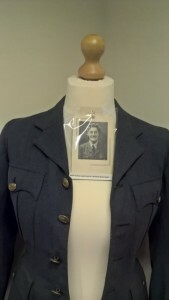 Stalls available on a first come, first served basis. £10 a stall plus a kind donation of an item for our charity raffle. Please message Aberlour & Speyside Rotary via Facebook to reserve a stall. Please be aware that some stalls will be outside (in tents) in the Square. Thank you!! A new Chinese takeaway food establishment has opened in the village, the Plum Garden in the square, Aberlour. 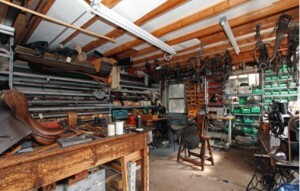 Local saddler Charlie Gammack was interviewed for the Out of Doors programme on Radio Scotland about his career. The program was broadcast on 30th September but is unfortunately no longer available on iPlayer radio. 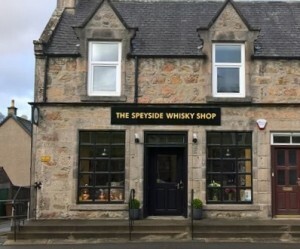 On 12th June, local celebrity/buisnessman Charlie Gammack will be giving a talk on over 150 years of Gammack’s Saddler’s shop in Aberlour Library at 7pm. 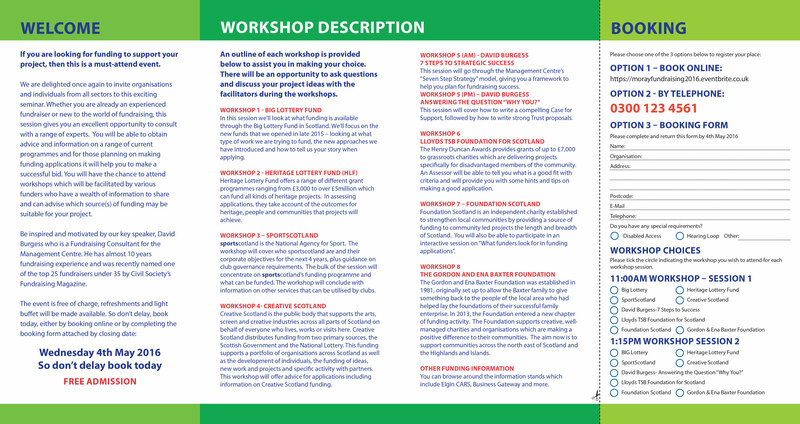 Please contact aberlour.library@moray.gov.uk to reserve your seat. 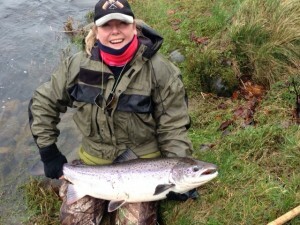 Lynn Sutherland with her 20lb plus salmon from Aberlour. Wind Farm funding – Local clubs and community groups are invited to apply for funding through the Paul’s Hill Wind Farm Fund. Contact patdolan7@btinternet.com for application form. 14/03/17 – The Spring show was held in Aberlour Fleming Hall on Saturday the 11th March, it was well attended with a good entry of flowers and crafts. 28/02/17 – A new hairdresser’s shop has opened on Aberlour High Street. Lush Hair is operating from 28 High Street, Aberlour. 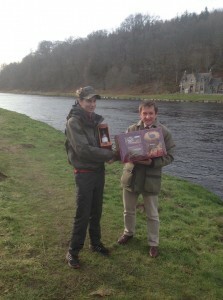 The Fishing season on the River Spey was opened by Angus Robertson, MP in Aberlour on Saturday 11th February. Heavy snowfall didn’t dampen the enthusiasm and a good crowd turned out. Aberlour celebrated the New Year with an impressive Fireworks display which could be viewed from the Alice Littler Park in Aberlour. Following the closure of the Bank of Scotland branch in Aberlour, the Bank of Scotland have introduced a mobile bank service, for opening times see this link. 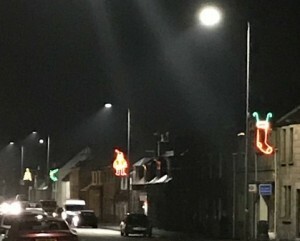 Aberlour’s Christmas lights were turned on, on the 24th November with well attended events both in the Parish Church and in the High School. As well as a Christmas tree / light display in the Square, the village has lights along the length of the High Street. Thursday 24th November, Aberlour is open for late night shopping and will incorporate the turning on of the Christmas lights display. We must sadly report the death of Aberlour resident, Dr John Caldwell, aged 93, who served as a GP in the area for many years, his father having also been a doctor in Aberlour. He will be missed in the village and was a long term member of the Church of Scotland. The 2016 Speyside Kiltwalk took place on Sunday 14th August, there were 3 levels – the 26 mile walk from Buckie, the 16 miles from Fochabers and a 5.5 mile return trip to Craigellachie with all participants finishing in Aberlour. The event was blessed by good weather and all attendees, dressed in tartan, were raising money for Scotland’s children’s charities. 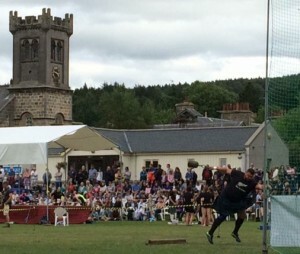 Aberlour’s Highland Games was held on Saturday 6th August 2016 and was a great success with over 4200 attending with many overseas visitors. 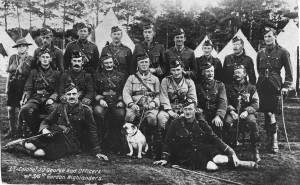 The day had the traditional heavy event, athletic (Light) events along with the spectacle of massed pipe bands, highland dancers, tug of war, pets parade and children’s races. 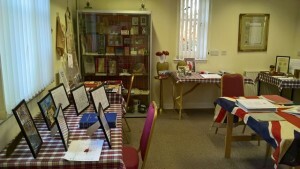 A big thank you to all everyone who took part, the organisers and all the visitors who attended. The Games weekend also included a couple of great gigs in the marquee, traditional Highland band, the Elephant Sessions, supported by Chris Grant played on the Friday night and on Saturday night Flashback Heroes performed, supported by Gordon James. Aberlour planning for real , have a look at the 3d map and see if you can find your home . 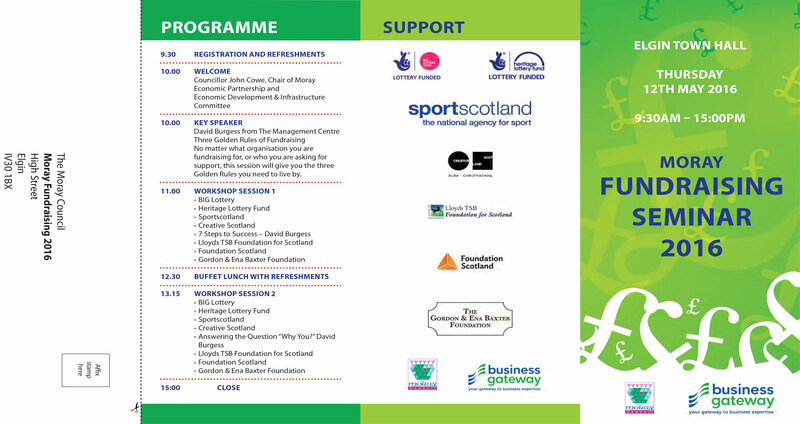 Are you looking for funding to support an event? 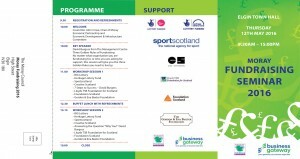 If so, this event on the 12th May in Elgin is for you. 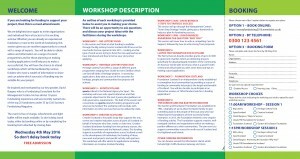 With workshops on different funding streams and suggestions for creating bids this day is an invaluable tool for any fundraisers. As you may be aware, Moray Council has withdrawn funding from the Speyside Way Visitor Centre. The Centre is situated beside the Old Station Tearoom to the south of the Alice Littler Park, fronting onto the River Spey. It has remained closed all this summer and there have been many complaints from visitors and locals about the loss of this excellent facility. The Aberlour Community Association and the Speyside Area Forum have been working together to investigate ways of opening this Centre next summer and making it an outstanding asset for Speyside. The most likely outcome is that the Centre will be open next year during the late spring, summer and early autumn months to provide information for both visitors and locals about the Speyside Way, walking paths and other outdoor activities. 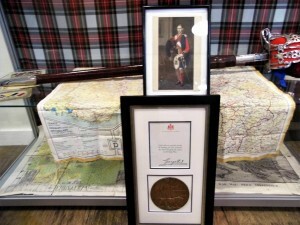 It will also provide information on tourist attractions, accommodation, eating places and shops as well as about the history, wildlife and the way that the land of Speyside is used. It would be helpful to have responses form volunteers by early January so that they can be involved in developing the project if they so wish.